De Renaissance Hotel is a 3-Star hotel located at No 172 Obafemi Awolowo way, Ikeja, Lagos. It's situated in a vibrant part of the Lagos metropolis and enjoys proximity to several landmarks like the Murtala Muhammed International Airport. De Renaissance Hotel boasts 61 rooms that come in room categories such as the Standard Room, Mini Suite, Family Suite, Executive Suite and Presidential Suite. 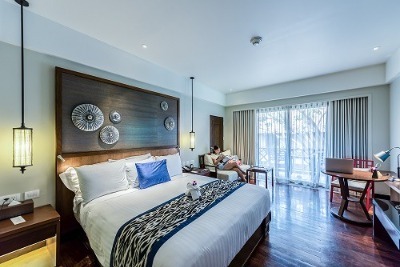 These rooms come with great facilities such as luxurious king-size single and double beds, flat-screen television sets, air conditioning, telephones, sofas, refrigerators, private bathrooms with shower facilities, wireless internet access, and armchairs. Guests at De Renaissance Hotel also get to take advantage of services such as: cushioned outdoor sit-out, in-house dining, restaurant, meeting rooms, event hall, regular power supply, guaranteed security, bar/lounge, and a well-equipped gym. Extra services such as business centre, dry cleaning and room service are also available at De Renaissance Hotel. Q: Does De Renaissance Hotel offer in-house dining facilities? A: Yes. It offers such facilities. Q: Is there a swimming pool at De Renaissance Hotel? A: A grand outdoor swimming pool is available for guests' use at De Renaissance Hotels. Q: Are Internet facilities provided for guests at De Renaissance Hotel? A: High-speed wireless Internet access is granted guests at De Renaissance Hotels at no extra costs. Q: What is the smoking policy of De Renaissance Hotel? A: Smoking in Rooms is highly prohibited at De Renaissance Hotels but allowed in designated areas. Q: Is there adequate parking space at De Renaissance Hotel? A: Ample parking spaces have been designated for guests to park their vehicles at De Renaissance Hotel. De Rembrandt Hotels and Suites is a top-class hotel in Ikeja, Lagos. The hotel had no issues at all, the staff and everyone present at the hotel were all cheerful and more than willing to help me with anything. I really enjoyed my stay, they had adequate parking space for all guest to park their cars. My stay at the hotel was awesome. The location was okay, the receptionists are friendly, and I am pleased with the customer service I received from the staff. The rooms were clean and beds really comfy. I had a really nice time. I stayed at the hotel and honestly, I must say it was really enjoyable. It was home away from home as I really enjoyed every bit of my stay.The environment was clean and neat and all the facilities were working well. I had a good stay at the hotel. The service delivery was on point. The staff were nice, friendly and ready to serve. The environment was cool and quiet. Very nice! My reserved room was comfortable and clean. Everything was just as it ought to be. Very good!!! It is a nine over ten for me based on the service delivery of the hotel. I travel a lot and I use different hotels. My usual hotel had an event and didn't have any available room so I opted for this hotel and I do not regret it at all. The environment is Perfect and they offer excellent services. I would definitely use this hotel again because I totally enjoyed my stay. Have nice pictures of De Rembrandt Hotels and Suites?